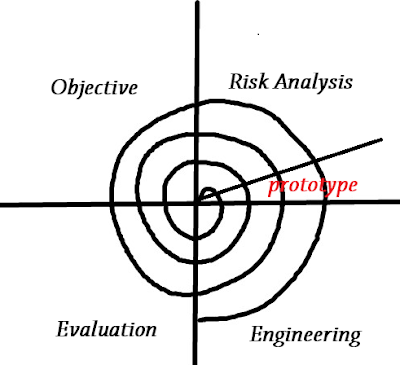 Spiral model is one of the type of SDLC. It is one of the old SDLC type which were first came in notice 1986. Basically spiral model is the combination of the Water Fall model and iterative model.The phases which is used in water fall model and the iteration which in used in iterative model both combined together and developed the Spiral Model. Whole software is not developed in once, development start with small requirement which goes through many phases like planning, development, testing etc. just like an incremental, like whole requirements are divided in each iteration and each iteration goes through each phase like planning, testing etc. and each new iteration add new functionality to previously developed functionality. This process is repeated many times until we get whole developed software. 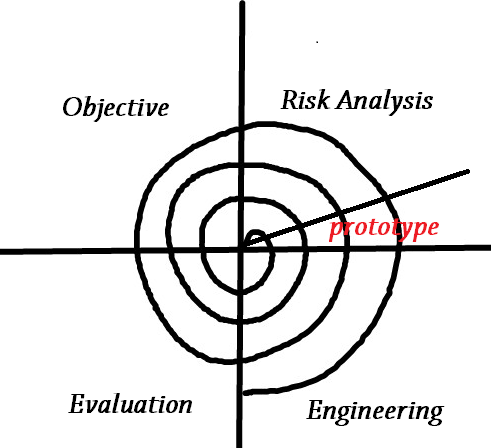 As shown in diagram it has four main phases, Objective, identification and solution of the risk, development and test and last one is planning of next iteration. Let’s start discussion on the first part. Objective (Planning phase): here the first phase is Objective, the aim is to get the requirements from the client. To develop any software the very first requisite is requirements. Here also in spiral model the requirements are gathered first. In this phase all work done by Business analyst and Client. Business analyst try to get clear requirement from the client to start the first iteration. Software requirement sheet and Business requirement sheet are created in this phase. One this phase is done the process goes to next phase which is Risk Analysis. Risk Analysis: Once the requirements are finalized then it need to be very important to do risk analysis for those requirements.Risk analysis means analyzing the future risk which may come and finding the solution for those in advance. There are risks related to the software as well as a team. For instance any requirement can bring any particular obstacle in future so finding the solution of that obstacle is nothing but risk analysis. If we start development without risk analysis then some obstacle may come because of that obstacle development will take lots of timeand dead line may miss, or sometime such a obstacles come because of that requirement we may need to change the requirements. After doing the risk analysis, a prototype is also created. Prototype is nothing but a copy of software. Like to give an idea after development this software is going to look like this prototype. After this the process goes to the third phase which is Engineering Phase. Engineering Phase: Engineering phase is the third phase, basically the Activities which are carried out in this phase are Development Activity, Testing activity, implementation, release etc. Once the requirement are gathered and risk analysis are done then development is started with selected requirement, once the development is done then testing activities started. The issues which observed during testing are reported and once they get fix, Tester retest. After this that particular build are planned to release. This all activities are done in this engineering phase. Evaluation: this is last phase where all the output of previous iteration is evaluated and planning of next iteration done. Planning of next iteration means which requirement should include in next iteration and its start end date are done in this evaluation phase. Early Risk analysis will reduce the chance to fail the project. Functionality can be added in later phase because of iterative nature. Early feedback from client as on each iteration we have something to show. Risk analysis required highly expertise people. Whole process is dependent on risk analysis if we fail in risk analysis this means project may fail. Spiral model is complex and costly to implement.